Khanya arrived at Care for Wild Rhino Sanctuary by helicopter on the 3rd May 2017. She was without food for about three days and therefore very dehydrated before section ranger Albert Smith found her. With the help of Dr Louis van Schalkvyk, Khanya was rescued and transported from the Kruger National Park. Khanya was about 6 months old on arrival. After just a few short hours, Khanya started drinking her first bottle of milk and with the help of a few drips, she was well hydrated. The staff at Care for Wild hand-picked bunches of fresh green grass for Khanya to enjoy between her regular milk feeds. Three days after her arrival, Care for Wild staff removed Khanya’s blindfold. Khanya was curiously calm when she finally saw the hands and faces that feed her. Just a few days later, Khanya had her first weigh-in and showed off her big rhino weight of 206kg! 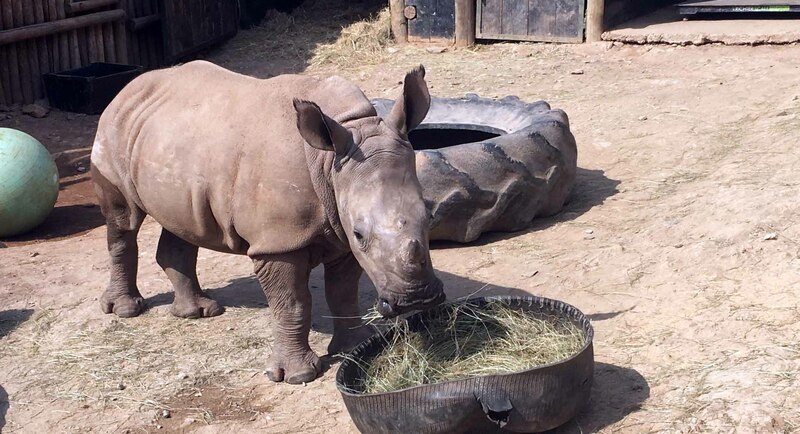 The name ‘Khanya’ is Zulu meaning ‘light’ which is beautiful for this little rhino who is full of energy and shows a strong character. She is very clever and loves playing with everything and anything she can find. Khanya was introduced to another orphan rhino, Rose, on the 18 June 2017 where they instantly became friends and co-dependant. The two orphans are still currently in the ICU due to their small size, young age and the cold winter. After the winter cold spells break, they will be moved down to the bomas with the other older orphans.